Blue flags will mark the shoreline of Captain’s Island–yes, until 1894 there was an island there–and white paint will mark Magazine Street as it extended, long ago, to the powder magazine. Magazine Street was, in fact, a State-maintained road on which gun powder was transported to the 1818 magazine: a secure granite-block building surrounded by a foot-wide brick wall that stored powder for the militia and private use. In the 1890s the marsh land was filled in to create the current footprint of Magazine Beach Park. Magazine Beach park as it once was. 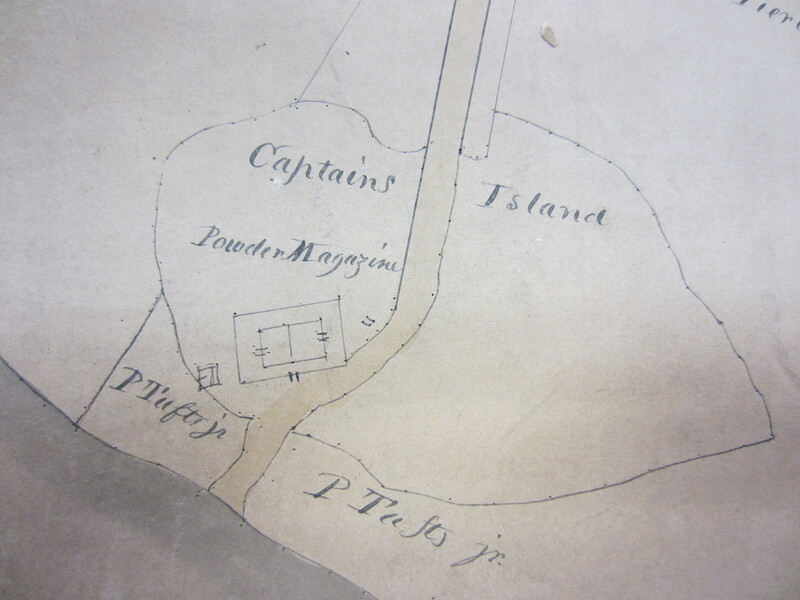 Detail from a Plan of Cambridgeport Parish, by Peter Tufts, Jr., Surveyor and Powder Magazine Keeper, 1824. Courtesy of the Cambridge Historical Commission. Come to our Celebration on Saturday, June 15, 12-5pm, for a picnic to the bluegrass tunes of Best Ever Chicken; a festive procession of children and activities for them, too; learn-to-row at the Riverside Boat Club; and lots of ART. There will be a sound and light installation about memory in the magazine, a community performance that may include as many as 50 participants around the structure, and If this park could talk… signs all over the place. Food trucks, too! Join us: It’s all free. Organized by the Cambridgeport Neighborhood Association, Inc., DCR, Charles River Conservancy, Riverside Boat Club, Cambridge Historical Commission, Cambridge Historical Society, Gallery 263, and UMassBoston. ← Installation and Performance Art at Our June 15th Celebration & Event Poster!